With the blink of an eye, Christmas was already over and we welcomed 2018! My wife just sent Stacci to primary school today and guess what? Even though Santa may be a little late, but Stacci and Leroy did receive a brand new school bag each, in time for school re-opening! Truth is, I am happy that 3/4 of the kiddos are going primary school already, because that meant some savings from having less childcare fees to pay. But when I think about picking them from school, I get a little "sianz" because their bags are freaking heavy! It doesn't help when I have to carry 3 bags altogether or risk them saying I am bias! A good ergonomic bag that they can carry on their own, would be a good investment for the growing kiddos (and for my old body). 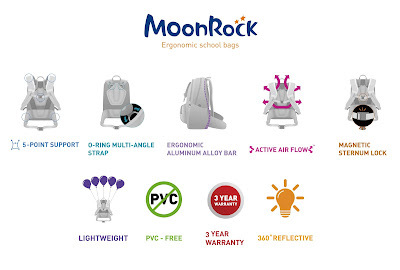 To be honest, I never knew about the MoonRock bags till the kiddos received their bags. The fabric used was strong but yet still relatively light at less than 900g, and I can feel it as I held the bag to see for myself how their books and stuff can fit into its many spacious compartments. 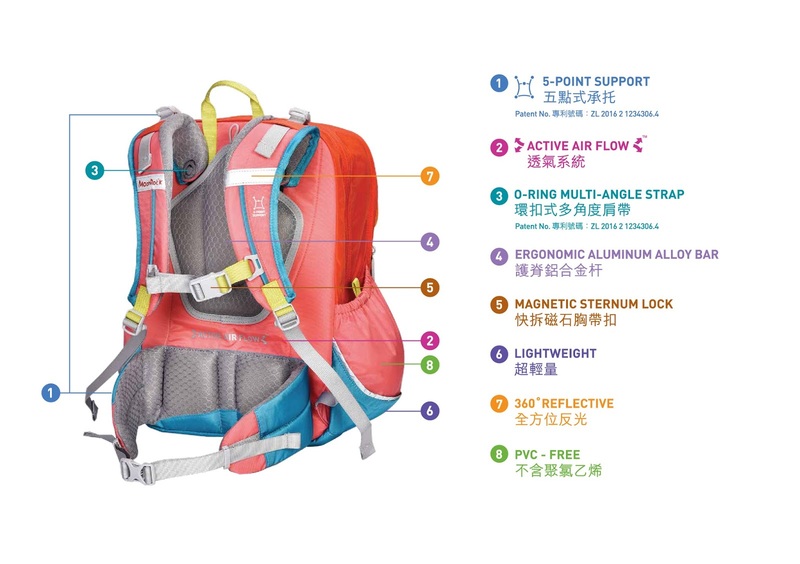 Because I know the weight the kiddos need to carry once the term REALLY starts, it is reassuring to know that the school bag is endorsed by the American Chiropractic Association, and the first in the world too! 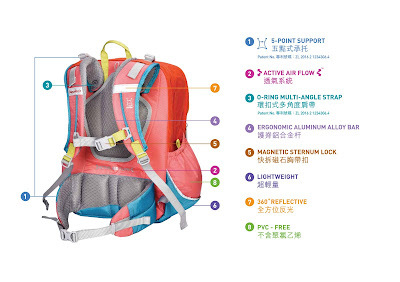 The thick padding at the bag allowed good air-flow and there are reflective strips all around for safety while crossing the road under low-light situations. Nowadays, one also need to be safe even on the walkway because of irresponsible e-scooters riders. 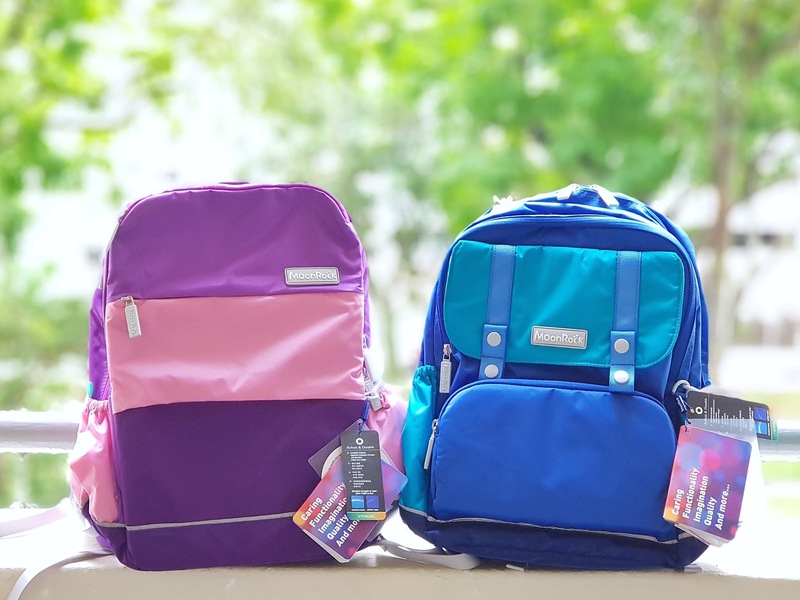 Ask any kiddos to choose their own school bag, and they would almost certainly request for one based solely on the looks (usually it would be some cartoon characters, be it licensed or knock-offs). But if you ask me to choose, I would definitely opt for some simple designs (which MoonRock offered), instead of some cheesy cartoon characters, and it is even better now, knowing that it would be good for their backs and keep the kiddos safe from any harmful materials too! Check out the following color combinations available! 5) Comment in the Facebook post and tag friends you know who would need one of these and share this great news with them! Meanwhile for you readers out there, do take note of the special promo code MR2017BTS (which is valid only till 31 Jan 2018) for 10% off online bag purchases at http://www.moonrocksg.com!